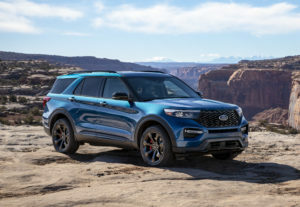 All Ford vehicles this year are to contain modems, and connectivity will eventually lead to a point where the OEM thinks it will be the referral source for auto body shops, “not DRPs,” a representative said Thursday. Ford knows its technology, strategy, connectivity, and consumer wants, he said. “I just tell people, ‘Let’s do this thing together,'” he said. The OEM’s research found that 52 percent of customers felt choosing a body shop certified by a manufacturer was more important than one conveniently located (7 percent), recommended by the insurance company (20 percent) and recommended by a friend or family member (21 percent). The automaker also has concluded that 27 percent of customers who got rid of their vehicles within a year and a half of an accident did so because of damage from the repair, according to Johnston. Another 21 percent did so because of the quality of the repair, he said. He said “much deeper” research indicates those customers ditching their vehicles don’t necessarily buy Fords. There’s a brand loyalty threat to the automaker. The OEM will “very, very shortly” refer consumers to certified body shops with its FordPass app, according to Johnston, who called it the “next phase” towards offering first notification of loss service. The latter here refers to the notion of automatically detecting a crash and reaching out to help the consumer — such as with a recommendation for a body shop. Even though Johnston described a future where insurers have reduced influence on customer shop choice, he also raised the possibility of cost-saving efficiency for a carrier. The initial 20-minute phone call to an insurer to convey basic information about a claim carries a “huge expense,” Johnston said. Johnston said Ford was talking to insurers about ways to help each other, with “productive work in play” currently. He said there would come a day “I really hope,” when a direct repair program is “one and the same” with the Ford network. Ford would hope both the OEM and carriers could agree on this and move on to discussing the efficiency of the network. “We can make this work for both of us,” he said. The modem installed within a vehicle drives its capability in terms of connectivity, he said. Johnston predicted that the next years will see the availability of connectivity go “straight up” in terms of its capability. 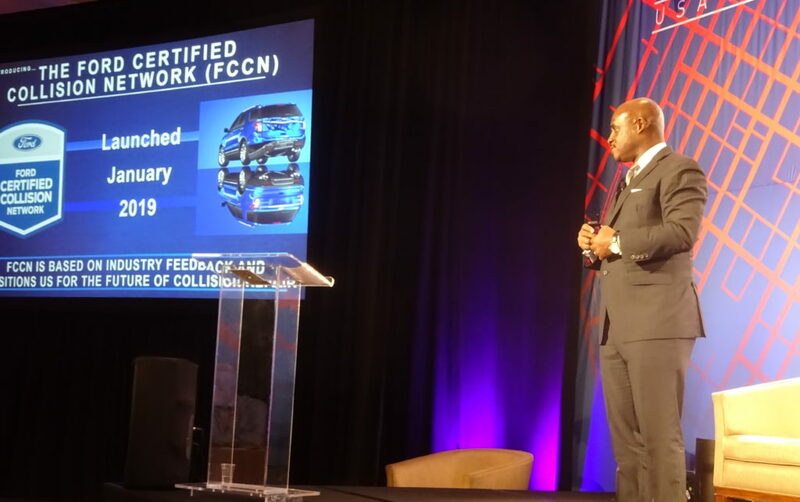 Ford global customer service division Vice President Frederiek Toney seemed to offer a similar vision in February during the International Bodyshop Industry Symposium. Toney said Ford couldn’t go it alone, and neither could insurers. Ford would be the first one to know when the vehicle fails, he said. It wouldn’t matter who owned the data, he said. The important question would be the process developed. Customers would go where they could be served, Toney said. Connectivity for first notice of loss is “a big deal,” he said. He said he knew stakeholders were worried, and they and Ford should design how to use it with respect to privacy but enhancing the customer experience and building efficiency.